t's not often geology and national security wind up in the same sentence. Most people don't think about electrical power in connection to either the ground under their feet or solar flares overhead, but Dr. Adam Schultz of Oregon State University, and EarthScope Magnetotelluric Program Lead Scientist, says that connection presents a clear and present risk that power utilities need to consider. "A big induced current in power-transmission lines that takes down high-voltage transformers would be a major disaster," Schultz said. "EarthScope is materially helping the U.S. build resilience against space weather on critical infrastructure such as power grids." The EarthScope Magnetotelluric Transportable Array, part of the USArray, is an observatory of instruments that measures Earth's naturally occurring electric and magnetic fields. Space weather is the flow of electromagnetic radiation given off by the sun, including extreme events such as coronal mass ejections that can intersect Earth's orbit, impacting electric fields on Earth. Schultz underscores threats from possible attacks as well. "There is a similar risk from man-made geomagnetic disturbances caused by electromagnetic pulse (EMP) weapons that resemble natural space weather events, although with even greater intensity and more concentrated local impacts," he said. At the 2017 American Geophysical Union Fall Meeting, Schultz will present recent research that examines a real-world example of 3D mapping of the crust and mantle of the contiguous U.S. from EarthScope data. The project looks at ground electric fields in the northwestern U.S. arising from space weather events, and shows data for reactive power loss at two different ends of a power line--and how it deviates dramatically from power-agency models. Only recently have federal energy regulatory bodies required electrical utility companies to incorporate electromagnetic characteristics of the ground surrounding power lines when assessing risk to the power grid from space weather events. These events can cause widespread damage, such as the 1989 geomagnetic disturbance that caused the power grid in Quebec to collapse, and a high-power transformer at a nuclear power station in New Jersey to explode. Power companies currently use large, regional-scale 1D estimates of crust and mantle electrical conductivity for vulnerability assessments, but these can lead to erroneous results because they are not based on current state-of-the-art knowledge of 3D structure. This can lead the electric utilities to consider some high-voltage transmission line transformers to be at risk of failure from space weather events when they may not be, and conversely could lead to under-protection of at-risk transformers that the 1D vulnerability assessment indicates are not at risk. "The consequence of getting this wrong can be significant," Schultz said. "There are very few spares available for the 2,200 high-voltage transmission line transformers that power the U.S. grid. Each transformer is custom designed, hardly any are built in the U.S., and the lead time for obtaining a replacement can be up to three years. A wide-scale, cascading failure of these transformers during a large solar storm event or EMP weapon attack can lead to massive disruption of the economy and of essential services for large sections of the U.S. population." Schultz's method uses information on 3D ground electrical structure, largely from the EarthScope program, but also drawing on other magnetotelluric surveys, which provides crucial information that 1D methods miss. "There is a fundamentally different relationship between magnetic and electric fields than shown in 1D models," he said. "1D imposes unrealistic, non-physical conditions that can be off by 1000s of percent from reality." Schultz found some surprising results in his northwestern U.S. project. 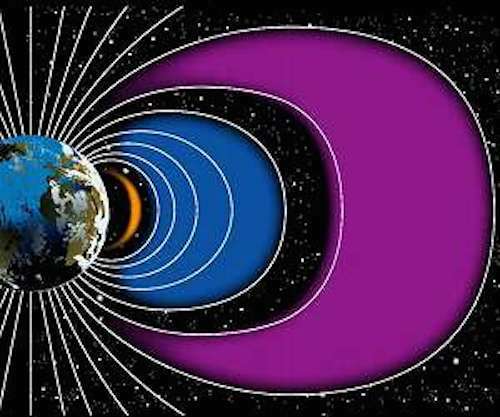 Previously, the assumption was that the biggest surge of geomagnetically induced currents (GICs) on a transmission line due to a space weather event would happen at the peak of the geomagnetic disturbance. However, depending on the 3D conductivity structure of the crust and mantle in the region of the transmission line, the time at which the ground electric field is of greatest intensity varies along different sections of the transmission line. Another surprise came when Schultz's 3D research showed that in addition to the intensity of the ground electrical field, the direction of the field matters as well. He found that a ground electrical field parallel to a power transmission line will generate a geomagnetically induced current in the line, while a perpendicular orientation will not. So even if a section of power line experiences a peak ground electric field at a given time, if the field isn't pointed in the right direction, it might not impact the power grid, whereas a less intense field oriented in the right direction might impact the grid. This is a far more complicated reality than used in vulnerability assessments previously employed by the power industry, with profound implications for grid reliability. Being able to reliably locate where ground conductivity could increase or decrease hazards along power lines has power companies paying attention. Using 3D mapping for power-grid assessments could help determine the most vulnerable sections of a power grid line, and potentially help inform power-flow management in real time. Schultz's research has applications beyond space weather: atmospheric nuclear testing or directed hostile action causes electromagnetic pulses that can damage power grids. Schultz recently gave a talk in Washington, D.C. about the methods for 3D mapping of ground electrical fields for risk assessment, and it received strong interest from a number of agencies. "In the long run, I think this is one of the more significant results to come out of EarthScope in terms of impacts on society because of the applications for overhauling how we assess our electrical grids, and the impact that has on all other critical infrastructure that depends on access to reliable power," Schultz said.